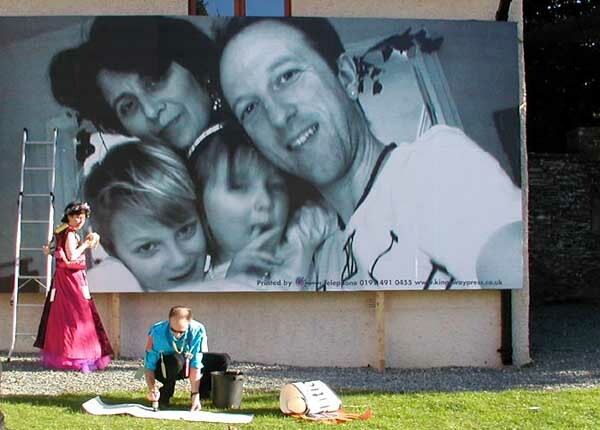 In September 2003 I married Rachel Feldberg, my partner of the previous 14 years. Rachel and I had remained un-married all this time as we had never felt the need of a State or Religious sanction for our relationship. Our decision to 'marry' was ultimately prompted by a desire to provide our children with greater legal and financial security. Given our unease about the institution we wanted to create a ceremony which reflected both the emotional texture of our relationship and our feelings about marriage as a very questionable social arrangement. Because of this we enthusiastically accepted the offer to have our wedding become part of a public art event curated by Grizedale Arts in Cumbria, entitled "Let's Get Married Today". The event was based around two separate marriages and would combine the ceremonies, the receptions and commissioned work by a host of contemporary visual artists. Initially we assumed Grizedale Arts would have the same critical and creative approach to working with the idea of marriage that we had. This seemed to be borne out when they commissioned Sue Gill from Welfare State International to devise our ceremony with us. We have both known Sue for many years and together we created a ceremony which combined the celebratory and the critical in an event which felt special and meaningful to us and and our children, and which also contained references to our shared perspectives on the history of marriage and our hopes about how it might develop in the future. Otherwise however, we were rather disappointed with the work produced for the event most of which concentrated on the trappings of conventional, white - virginal/western - weddings (tiered cakes, hen-nights, best men, wedding cars, speeches, sexual innuendo, brides and grooms etc.) with a few cheap shocks (chauffeurs with bare bottoms) thrown in for effect. 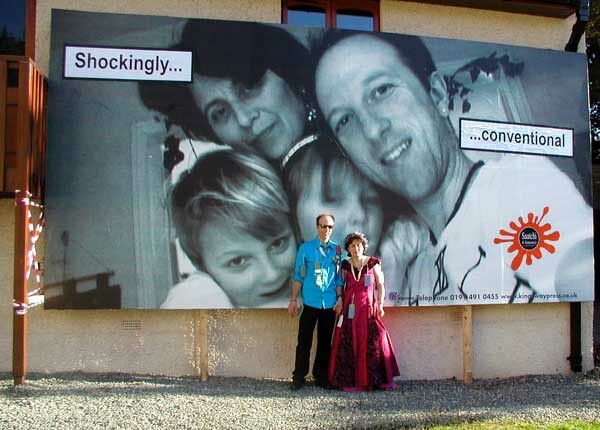 One element of the Grizedale event was to produce a billboard poster of an image from each couple's photo album - ours was a picture of us and our children at our Millennium Eve party. As the big day grew closer we were becoming increasingly frustrated with the blandness of the programme and we began discussing various forms of intervention we could make - anything which might put the notion of marriage into question or offer a re-contextualisation of it's meaning. It took a surprisingly long time before I suggested 'doing a Saatchi & Someone' but once I did, it seemed so obvious that we simply had to. As we planned and executed the piece together we needed a new name, we rejected the obvious change to 'Mr and Mrs Saatchi & Someone' and finally opted for the less gendered 'Saatchi & Someone(s)'. The method used was exactly as with the original interventions of 12 years before and we did it as an un-announced intervention. The text 'Shockingly...conventional' was intended to refer to both ourselves and our decision to marry after so many happy years of co-habitation and also to the rather alarming conventionality of Grizedale Arts' approach to the event. The typography in the style of cigarette packet warnings was entirely un-intentional but perhaps gives a sense that the text might be framed as a health warning about marriage. As an added bonus the only two people who ever helped me when I did the original Saatchi & Someone interventions were at the wedding as guests and they helped Rachel and I do the work so the whole thing became a brief S & S reunion.